Your hips bear the weight of your body and let you walk, run and jump. When arthritis pain limits their movement, you might find yourself enjoying fewer everyday activities. Hip replacement at a Ballad Health hospital can help you get back in action. To decide whether hip replacement is right for you, a surgeon will review your medical history, look at how your hip moves and order an imaging test to see inside the joint. The imaging test shows if cartilage, or cushioning, has worn away between hip bones. Without enough cartilage, your bones rub against each other and cause pain. What happens in hip replacement surgery? 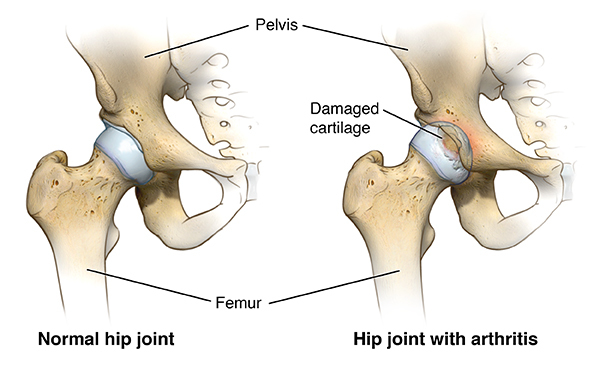 Your doctor begins hip replacement surgery by removing damaged cartilage and bone from your joint. Then, he or she then puts in place a metal, plastic or ceramic joint that’s right for your body size, gender and activity level. Anesthesia will keep you from feeling pain during surgery, which lasts a few hours. Most often, surgeons get to the hip joint from the back (posterior) of your body. But you can ask your surgeon if he or she will come from your front side (anterior). The anterior approach uses smaller incisions, or cuts in the skin, and affects fewer muscles. That reduces your pain, scarring and recovery time after surgery. Unlike total hip replacement, hip resurfacing doesn’t remove the ball of your joint. Instead, hip resurfacing caps the ball with a smooth covering. You might qualify for this procedure if you’re younger than 60 and have strong, healthy bones. The joint slips out of place. High-impact athletic activities wear down the joint. You experience a hip infection. Tell your surgeon if you notice pain, swelling or stiffness after your recovery from surgery. You may benefit from hip revisioning, or a replacement of your artificial joint. At Ballad Health hospitals, you’ll find complete orthopedic care, support and answers to your questions before and after surgery. And you’ll benefit from hospitals recognized for safe, affordable, high-quality hip replacement services. What do hip replacement patients say? If the hospital closest to you isn’t listed above, please call (423) 431-6937 for more information.